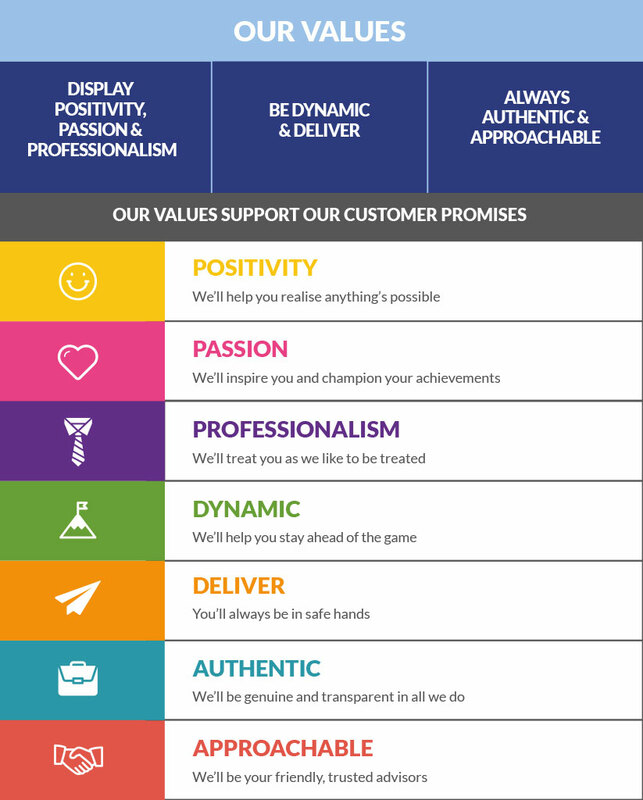 Our seven values form our commitment to you. Together, they ensure that we deliver a level of service which is unsurpassed. We promise we’ll help you implement ISO management systems in a positive way so your key stakeholders understand the benefits of certification for them. Wherever you are on your ISO journey, we’ll help you take the next step. Whether providing training, giving advice or auditing you, it’ll always be clear that we’re here to help you succeed. We promise to share your passion for what you do as well as sharing our passion for business improvement with you. We’ll inspire you by passing on the experience we’ve gained from working in other organisations as well as our own. We’ll help you publicise your achievements, sharing your story with other like-minded businesses. We promise we’ll be professional at all times: we’ll respond to your queries quickly, we’ll respect confidentiality and we’ll be reliable and trustworthy in all aspects of our behaviour. We also promise not to take a ‘one size fits all’ approach. We’ll take the time to understand your needs before proposing a tailored solution which has no hidden extras. We promise to be dynamic. We’ll anticipate changes in the market and innovate so our products and services best meet your needs. We’ll always offer constructive feedback to help you make positive changes to your organisation and we’ll help you maintain long-term compliance by informing you of forthcoming changes to your standard/s. We promise to deliver by ensuring our service can’t be beaten. We’ll only employ people who share these core values and will want to help you succeed. We’ll get to know your business so you don’t have to go back to square one on every visit. We’ll ensure you get what you pay for, for example, by proactively managing your ISO certification schedule to ensure you never overlook an audit. We’ll deliver value-add by partnering with organisations which can offer you relevant services. We promise to be authentic. We’ll have a genuine interest in what you do and we’ll be a trusted advisor that you can turn to. No query will be too small and no problem too large. We promise not to recommend unsuitable products/services. We’ll ask you for feedback and use this to shape our future plans. Finally, we promise to be approachable. Our assessors are the friendly faces of ISO. From board level to factory floor, we’ll communicate in language that people can understand. We’ll welcome your enquiries and do our best to help you, even if it’s not strictly ISO related.